A frequency-modulated continuous-wave (FMCW) 78 GHz cloud radar, designed by the Millimetre-Wave Technology (MMT) group of the Rutherford Appleton Laboratory (RAL), began operations at the MST radar site on 14th April 2005. It detects the Rayleigh scattered signals from hydrometeors. Since the radar return signal power increases with increasing hydrometeor size, but decreases with increasing range from the radar, the instrument's sensitivity to clouds depends on the cloud type. It has proved itself capable of detecting fog, which was not previously thought to be possible for a cloud radar. It has primarily been operated over the altitude range 0 - 16 km, with measurements recorded at intervals of 30 m in altitude and 30 s in time. Other altitude ranges and sampling intervals are user-selectable. Since this is still an experimental instrument, which is undergoing development (see below), the data files merely contain altitude profiles of radar return signal power. These have neither been range corrected nor converted into cloud products. In order to aid the development of this instrument, the MMT group would like to know how the data are being usedt will be useful for the MMT group to know how the data from their instrument s Those making use of the data from the cloud radar are asked to keep the MST Radar Facility Project Scientist informed of their progress so that The instrument is likely to return to RAL in September 2005 to allow further development work to be undertaken. The radar started life as an altimeter (a device for measuring the altitude of an aircraft above the ground). It was modified for atmospheric profiling in the mid 1990s and spent some time in operation at the MST radar site at this early stage. Since then it has undergone considerable development within the RAL MMT group with support from the Met Office. It has been deployed on a number of campaigns both within the UK (e.g. at the Met Office's Camborne site) and abroad (in both Switzerland and Mauritius). Since the instrument was not designed with an active cooling system, it must be switched off during hot weather to prevent overheating. Data are not therefore available on a continuous basis. A known issue arises from the very strong low-altitude radar returns associated with rainfall. These give rise to "banding", whereby saturation effects increase the baseline across a large range of altitudes. Rather than modifying the present version of the radar, it is planned to address the rain saturation and cooling problems in a future prototype demonstration model. What's unusual about this radar. Cloud radars typically transmit pulsed signals (in the same way as the MST radar) and determine the range of targets from the delay between the transmission and reception of a pulse. Owing to the relatively high peak transmitted powers (~ 1 kW), they rely on expensive vacuum valves, which are prone to degradation over time scales of 1 - 2 years. An alternative technique is to "chirp" the signal, i.e. to linearly sweep the transmitter frequency, and to determine the range of a target from the frequency difference between the transmitter and receiver signals. Since signals are transmitted for a much longer period than in the case of pulsed radar (there are still gaps between chirps), detectable return signals can be achieved with a much lower peak transmitter power (200 mW in the case of the RAL radar). This means that FMCW radars can be designed around lower-cost and more-reliable solid-state components. 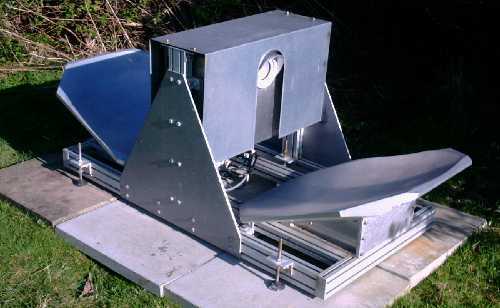 The 35 GHz instrument at Chilbolton - an example of a pulsed cloud radar.